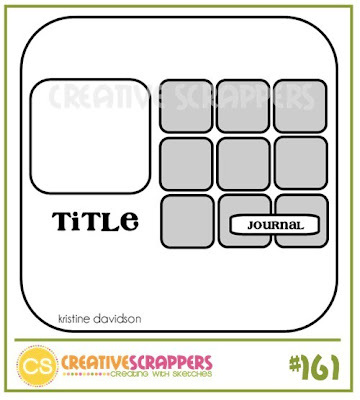 I'm HOSTING CHALLENGE 101 @ LET'S SCRAP!!! It's my turn to host the weekly challenge at Let's Scrap this week . . . and it's a FUN one!! I'm doing a little tutorial on Exploding Boxes. If you've never made one before, then you're missing out!!! They are super easy to make and make great gifts for family and friends. For the challenge I made a little box for Ruan to celebrate his 16th Birthday. I got a little emotional while making the box because I can't believe my baby is turning 16 already!!! I just love the end product!! I used My Mind's Eye Lime twist collection papers, stickers and die cuts! I would love for you to come and join us this week at Let's Scrap. I have a nice prize up for grabs!! Come and play!!! New photo challenge at Scrapping Everyday Miracles!! It's Wednesday and my turn to host the "Capturing Everyday Miracles" challenge at Scrapping Everyday Miracles! This challenge is about sharing God miracles and blessing through your camera lens. It can be anything that touches your heart and soul!! This is the place where you can share what you think God are blessing you with in the here and now! I shared some of our holiday pictures and how each one of them showed me a different way of how God is all around us, taking care of us and loving us!! To make it each for you just click HERE to go to the SEM blog!! I would really LOVE it if you would play along with us, sharing with us your picture! Just click on the Inlinkz button at the end of the post to link up your photos. I can't wait to see you blessings and miracles!! 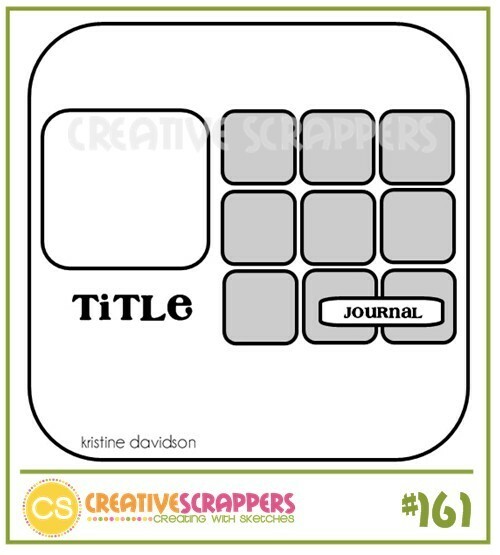 This week @ Let's Scrap! And here is what I came up with. I used pictures from my friend Mari's little boys 2nd birthday party! I love how the border turned out. It works perfectly with the photos and it really gives the LO a fun feel! Here are a few close-up shots from the LO! The DT girls really rocked this one. 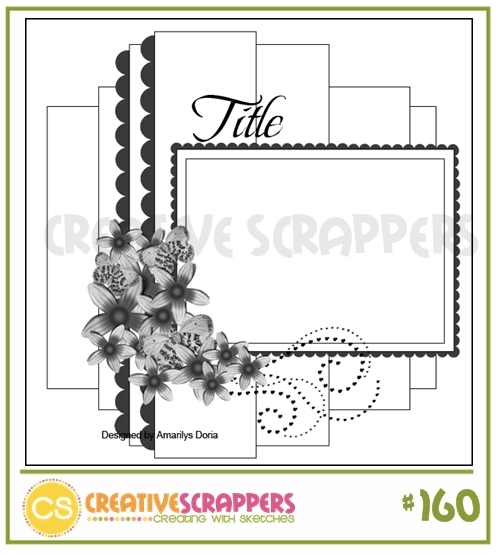 Hop on over to the Let's Scrap blog and check out all the gorgeous layout! We sure hope you'll play along with us this week, there is a great prize that's up for grabs! Also, check back on Friday at Let's Scrap for the DT challenge! 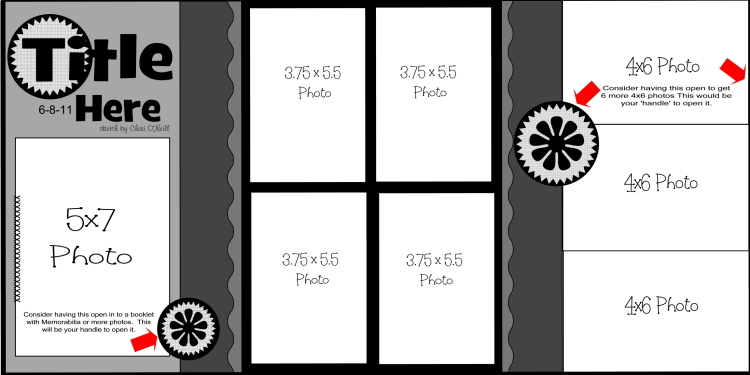 It's my turn this week and I'm doing a little tutorial & challenge with an exploding box. They really are fun and oh-so-easy to make, and make wonderful gifts to friends and family! Challenge 2 is all about the little Blessings!! Here is my layout for challenge 2! We would love for you to play along! 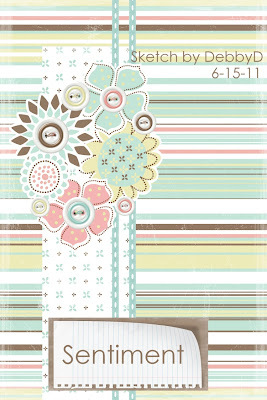 You can upload your projects to the Scrapping Everyday Miracles blog to stand a chance to win a $20 GC from Ringo Craft! Good luck, and I can't wait to see the everyday miracles in your life!!! We're back after one F.A.B.U.L.O.U.S little vacation!!! I'll share pictures in a later post today to make you all drool!!! It's just so beautiful in the Maldives and we really enjoyed every moment! On to scrapping . . . I used scraps from Bo Bunny's Sophie collection to make my friendship card! I just love the sentiment!!! I was in a scrappin' mood yesterday so I was checking out all the diffirent challenge blogs on the web to find one that would have a sketch/challenge that would work for me. At Creative Scrappers I found this gorgeous sketch . . .
And at Soul Scrappers Shazza has this GREAT music/lyrics challenge using the John Farnham song "You're the Voice" . . . it's such a beautiful song that really spreaks to my heart! I used both the sketch and the song as inspiration to create a layout for Monique. It seems that my daughter is a bit lost these days and I wanted to convey to here that she's the voice of reason in her own life! Here is my layout with so close-up's! That's it on the scrapping front for today . . . I'll be back soon with some vacation photos! 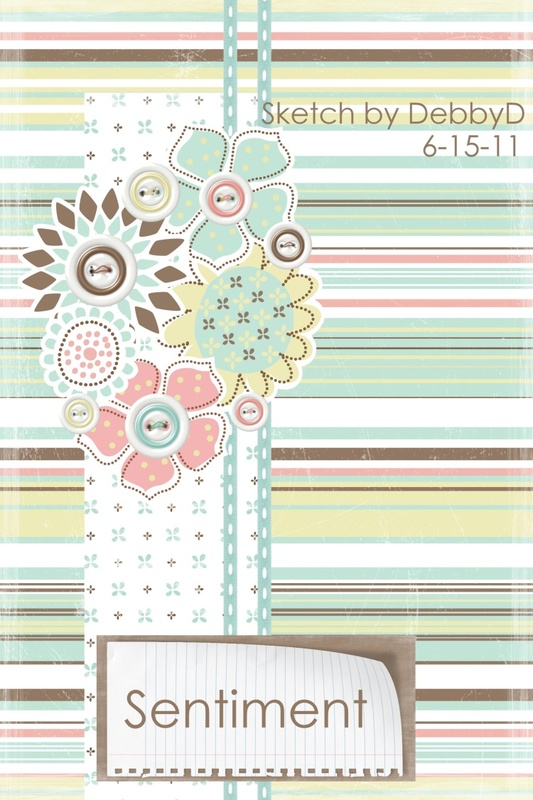 This week's sketch @ Let's Scrap! I quickly wanted to share with you this weeks Let's Scrap sketch before DH and I left for a little vacation to the Maldives . . . I'm so excited!! This will be the first vacation ever that we take without our children! I'm a little nervous about that . . . 2 teenagers alone for 6 days?? Luckily we live in Saudi Arabia in a compound so not to much trouble for them to get into!!! For my layout I did the flip out page but not the booklet! If you new to the flip out pages you can learn more about them HERE. And for the booklet you can see Michelle's tutorial HERE. There you have it!! Now I'm off the sip fruity cocktails on the beach!! See you soon!!! It's our first challenge at Scrapping Everyday Miracle!!! First of all . . . THANK YOU to everyone who has HoPpEd with us to kick off this new and exciting challenge blog!! It means so much to us to have you here and to share God's blessings & miracles with each other! The blog hop winners will be announced on the Scrapping Everyday Miracles blog on Wednesday! *** Challenges will be posted on Mondays on the 1st and 3rd Monday! We have some wonderful challenges celebrating God"s little miracle and blessings with a scrappy twist!! These are thought provoking but fun challenges! *** Capturing God's Miracles will be up every Wednesday where the DT members will share photos they captured in that week of a everyday blessing or miracle that they witnessed! There will be a link for you to share your pictures with us as well!! I can't wait to see what God's doing in your life!!! *** Praise Posts every Friday . . . It's the little things that can encourage someone else so much! *** Tutorials & Techniques every 2nd Monday of the month ~ because we love to learn more about scrappy stuff!!! *** Inspiration Posts every 4th Monday of the month. 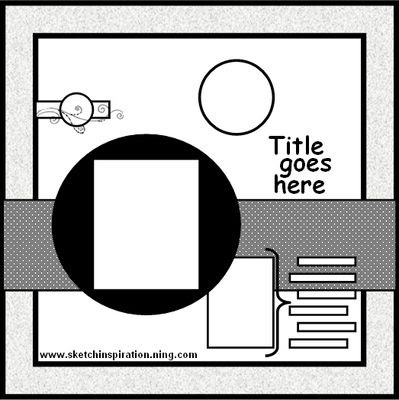 The DT will share what inspires their layouts . . . if it's a sketch, an advert, a project they've seen on-line, a song, etc!! Inspiration for scrapping projects can be found everywhere! WOW . . . That's a lot of information!!! Now we can get to the fun part . . . CHALLENGE 1! It's all about the Little Things!!! We want you to focus on your own everyday miracles!!! What is an everyday miracle you ask? An everyday miracle is something maybe you would have overlooked... something maybe we havent looked at that way before... or something simple that reminds of us of how great our God is... It is that hug from God that says I'm here.... It seeing God in the simple things... everyday He has miracles all around us we just need to take the time to look!! The scrap twist for challenge 1 is to use computer journaling and paint or mist on you project! 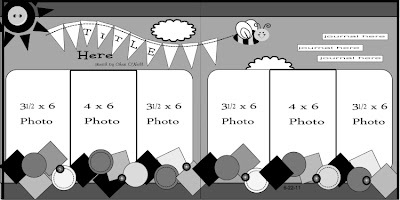 blog by June 30th.... and you could win a prize from our lovely sponsor Crafty Girl.... remember to stop by and check out all their fun products. 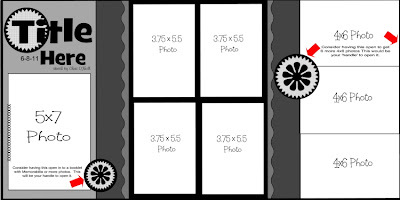 You can win a $15 gift certificate to the Crafty Girl Craft store!! For me the love we have for each other as a family is a everyday miracle! It's something that carries you through each day! But I want my children to understand that the love I have for them . . . unconditional love . . . comes from God! (1 John 4:7) Because of His love for me and my love for Him, I have love in abundance to give to them! For me this is so powerfull!! God's love truly is a everyday miracles if we choose to accept it in our life's!!! blog to show us your project and to stand a chance to win! I'm so excited to see your Everyday Miracle!! !